Unauthorized access to users’ Exchange 2013 mailbox is a key security concern for many organizations. In a previous article (that we advise you to read first), we explained how UserLock 7 can control remote access to Exchange 2010 mailbox through either Outlook Web Access (OWA) or ActiveSync. In this article we will outline how UserLock 8 protects access to Exchange 2013 mailbox and offers the control and visibility to Internet Information (IIS) sessions to help stop security breaches. As before, we will perform our demonstration on a small Active Directory environment: The server VES1 is the domain controller where UserLock 8 is installed. 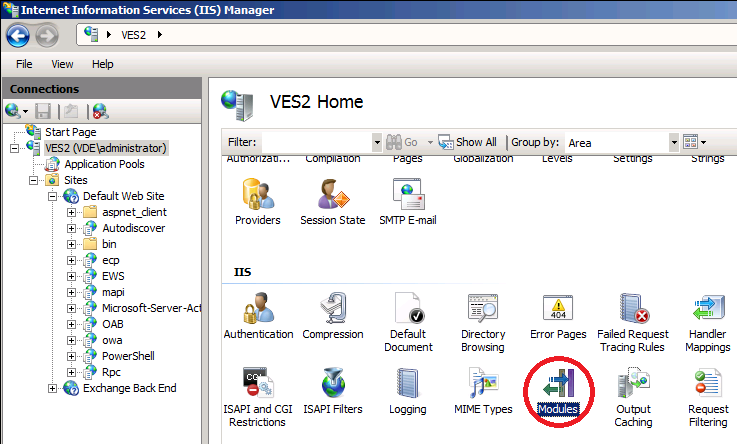 The server VES2 has Exchange 2013 installed with the Client Access role. We will also use a workstation VEW1 to access a mailbox with Outlook 2013 and OWA. 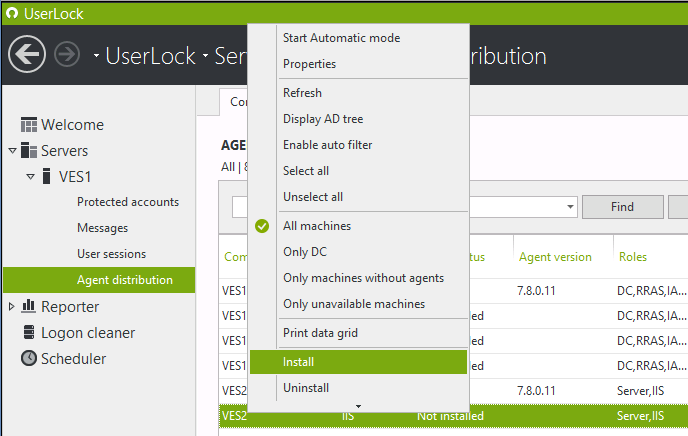 From the ‘Agent distribution’ view we can install the IIS agent on the server VES2. The first difference you will notice is that we need to finish the installation either by registering the ISAPI filter (as we did in our previous article) or by registering the HttpModule. 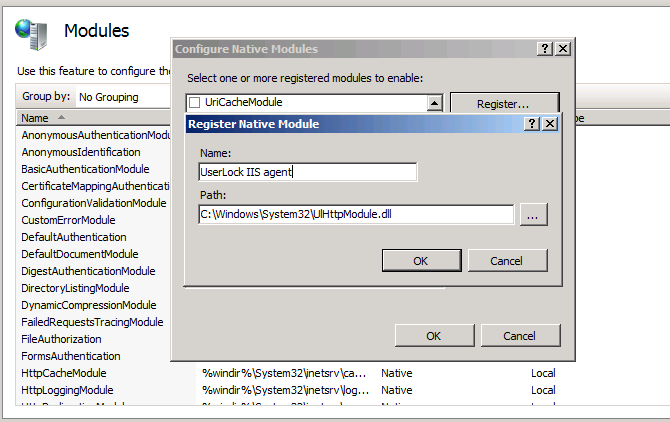 The UserLock HttpModule is a new agent to control IIS sessions. The main goal of this new agent is to improve the overall compatibility with most web applications. With Exchange 2013 we get a better result with the HttpModule so we will continue our demonstration with this. Next, switch to the IIS management console on the server VES2. At the root of the server we open the Modules. Click on Configure Native Modules. Specify the path to the UserLock HttpModule located at the following path: c:\Windows\System32\UlHttpModule.dll. 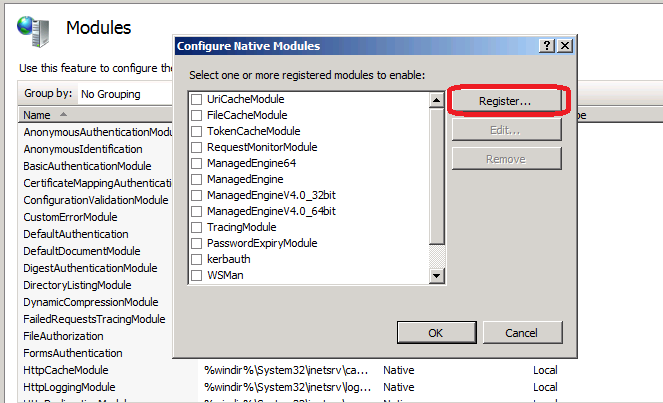 Once we click OK the module is selected in the native module list. 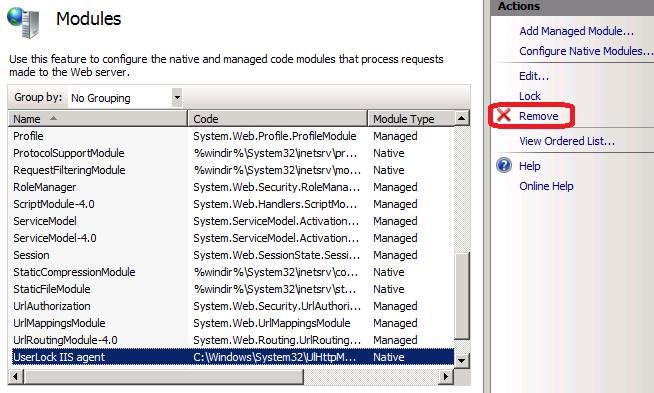 If we leave the module selected it will be active server wide for all IIS applications. We recommend unselecting it and enabling it only on selected applications. To illustrate this, if we had left it selected for the whole server, the result after opening a single instance of Outlook 2013 on the workstation VEW1 (10.2.2.11) would be as follows. 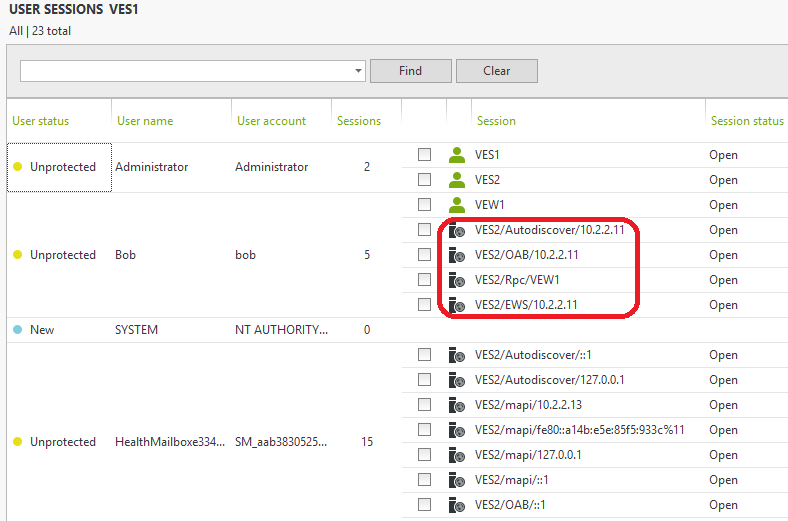 Looking at the sessions in the UserLock console you can see a lot of different sessions for just one instance of Outlook. 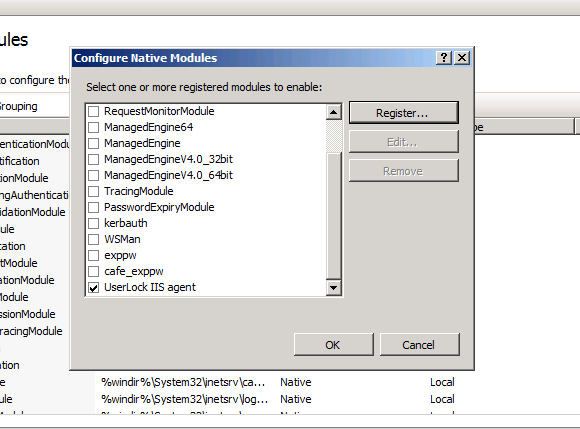 Now remove the UserLock agent from the modules list at the root of IIS. The module will remain registered and available for selection in child applications. Next enable it only in the OWA and Microsoft-Server-ActiveSync applications. We can now see the result after all application pools have been recycled. 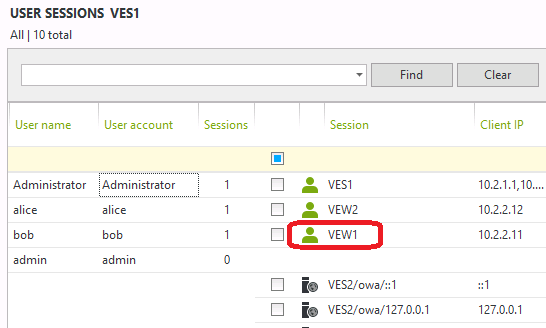 The user Bob has an interactive session open on the workstation VEW1 (10.2.2.11) with Outlook and OWA open but we no longer see the IIS sessions generated by Outlook. Next, let’s make Bob sign out from OWA. 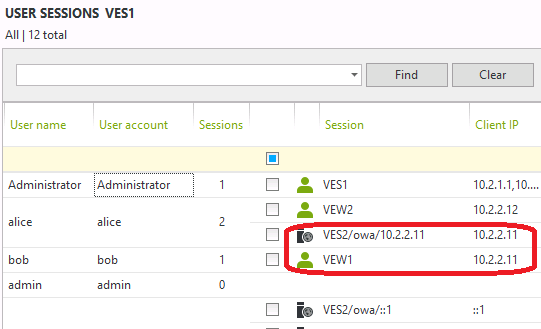 In UserLock 7, the session would still be open and would be considered as closed only after a timeout, but if we look at the session view in the UserLock 8 console we can now see that the session is gone and Bob has only its workstation session on VEW1 still open. UserLock 8 can detect when a user signs out from OWA. 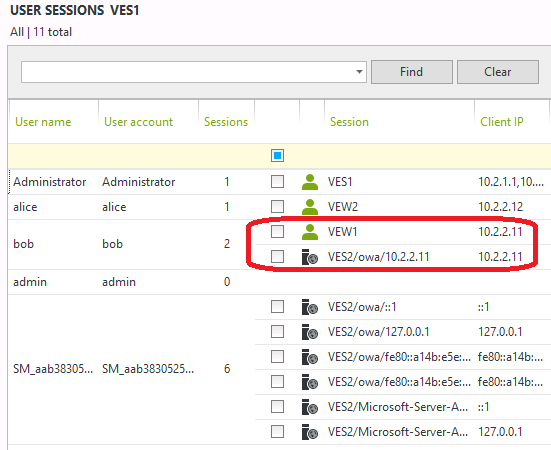 Now, if we let Bob open a session on OWA with Alice’s credentials you can see clearly in the UserLock console that the OWA session from Alice is generated from the IP address of the workstation VEW1 where Bob is logged on. If we are the UserLock administrator, we would now be legitimately suspicious by seeing Bob accessing Alice’s mailbox. In this scenario the administrator can simply select the identified suspicious session and click logoff to close the suspicious access. As a precautionary measure the administrator could create a protected account rule for Alice to deny IIS sessions from the address 10.2.2.11. And if Bob tries to logon again with Alice credentials on OWA, he will receive the following deny message. As you can see, with UserLock 8 an administrator can quickly react and sign out a user from a mailbox thanks to the new IIS session logoff feature. In our next article we’ll show you how a user can be directly alerted by UserLock 8 when someone else is accessing their mailbox.